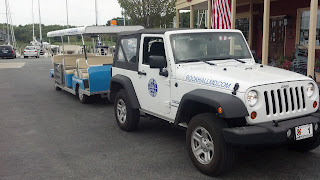 We arrived at Rock Hall, a small, quaint town with a trolley(Rock Hall Landing Marina) . The newly instituted trolley is pulled by a Jeep and was developed to assist transient boaters. It costs $1.00 per person for a ride anywhere in town. You can either call them or just catch a ride as they pass by. On our trip to the grocery store, the driver offered to show us around. He took us to all of the marinas and through the small downtown. They are trying to promote business for the restaurants and shops. Because it rained/stormed during the night, we decided to stay another day. A familiar boat pulled in behind us this afternoon......John and Marsha on Kadadi. We han't seen them since we were on the Tennessee River at the Rendezvous last fall. The end of May, John fell off the top of his boat and broke his leg in 3 places. The leg is healing nicely now, so they are trying to make up for lost time by traveling 90 miles a day. Going home to Canada. Kadadi and Adagio both headed for the Delaware City Marina after passing through the C&D Canal which connects the Delaware to the Chesapeake. If all goes well, we will head out Delaware Bay to Cape May, NJ in the morning. This bay can have dangerous winds, currents, and tides, but the forecast for tomorrow is good. We had a pleasant ride down the bay (2's to 3's). The last few miles of the ride turned out to be a bit bumpy as we turned into Cape May. We passed the ferry terminal just minutes before one of the large ferrys pulled out into the channel. Hope you make it to Cape May, one of our favorite places to visit when we lived in New York for 11 years. Your adventures are truly remarkable. I hate to say that temperatures in Florence haven't reached 80 degrees yet.